In Asian countries, depressed patients has been reported to present physical symptoms more mainly than psychiatric symptoms. However, there is no valid and suitable rating scale for those kinds of depression, especially in accordance with Eastern medicine. With this background, we have developed an original rating scale, the K–Style Acupuncture Score (KSAS), to assess the depression such as masked depression. To verify the KSAS measure, we examined the correlations with other depression scales. We also assessed whether the KSAS could be an indicator to detect the therapeutic effect of acupuncture on depression. Twelve healthy subjects and 30 depressed patients participated in this study and underwent the assessments of psychological batteries and the KSAS measure before and after Press Needle (PN) acupuncture intervention in a randomized, placebo-controlled design. To evaluate a cross-sectional difference between the healthy subjects and depressed patients and longitudinal changes before and after the PN acupuncture in the KSAS, we performed a three-way analysis of variance (ANOVA) with time as a within-subject factor and intervention (active vs. sham) and group (healthy subjects vs. depressed patients) as between-subject factors. We also performed correlation analysis between the KSAS measures and each of the psychological tests. The ANOVA for the total score of the KSAS showed significant main effect of group (F1, 38=9.893, P=0.003) and time-intervention interaction (F1, 38=4.403, P=0.043). Further, we observed significant cross-sectional and longitudinal correlations between the KSAS measure and other psychological metrics. The present study demonstrated the validity and utility of the KSAS measure to assess depression in the context of acupuncture medicine. • The KSAS measure could distinguish healthy subjects and depressed patients. • The KSAS showed cross-sectional correlations with TMI, BDI-II, STAI, and GHQ28. • Total score changes of the KSAS could detect a therapeutic effect by active PN acupuncture. • The KSAS score improvement was longitudinally associated with improvement in BDI-II score. Alternative and complementary therapy for depression has been emerged as an important option in these days [1-4]. Specifically, recent studies have provided empirical evidence [5,6] to support the effectiveness of acupuncture for depression [7-9]. Although the association between physical and mental symptoms has been pointed out since ancient times [10-12], there is no useful rating scale for mental illness in accordance with Eastern medicine  that reflects the psychosomatic correlation (i.e., mind-body relation)  including depression [15,16]. Further, it has been known that there are crosscultural variations in presenting symptoms of depression [17-20]. Specifically, somatization has been reported to be a characteristics feature among non-Western patients with depression . Indeed, higher rates of somatization have been also reported in depressed Japanese, Chinese, and Turkish patients, compared to the western people diagnosed with major depression [21-23]. These facts often bring the difficulty to assess and interpret their severity of depression in Asian population, because standard rating scales for depression usually do not cover those kinds of aspect of cultural gap in reporting the depressive symptoms. With this background, we have developed an objective scale, the K–Style Acupuncture Score (KSAS), to assess physical findings in the context of Eastern medicine at the Kanagawa Psychiatric Center, Japan . Prior to the present study, we have confirmed the inter-rater reliability of the KSAS measure at baseline . In the present study, we aimed to replicate the diagnostic validity of the KSAS measure by exploring the relationship with other psychological tests, and investigate the utility of the KSAS measure whether it is able to detect the therapeutic effect of acupuncture as a novel rating scale in psychiatric acupuncture medicine. Thirty patients with an affective disorder (20 with major depressive disorders, six with bipolar disorder, and 4 with dysthymia) and 12 healthy subjects participated in this study. We recruited the patients from an inpatient facility at the Kanagawa Psychiatric Center. Medication in patient group was kept constant during the study period. We excluded the patients who have comorbidities such as other mental disorder, neurological disease, epilepsy, head trauma, and alcohol and/or substance dependence. The local ethics committee of the Kanagawa Psychiatric Center, Japan, approved the study (#2010–4), and all participants provided written informed consent. KSAS measure has been developed at the Kanagawa Psychiatric Center in Japan initially to assess patients with depression by digitizing palpation findings of meridian acupoints related to psychiatric symptoms especially for major depression . KSAS consists of two main components; that is, 1) the Mental Index (Seishin-hencho) score and 2) the Physical Index (Fukujin-totaisha-kan-meneki) score. Further, the Mental Index (Seishin-hencho) score includes 5 items such as i) psychiatric head findings (tobu-oketsu; e.g., autonomic symptoms, psychiatric anxiety, irritability), ii) psychiatric abdominal findings (fukubu-oketsu; e.g., emotional instability, postpartum depression), iii) psychiatric autonomic findings (ki-no-yamai; e.g., hyperactivity in autonomic function, overstressing state, psychiatric anxiety), iv) sleeprelated findings (suimin-shougai; i.e., insomnia), v) wounds-related findings (shoukon; i.e., history of physical trauma), and the Phsysical Index (Fukujin-totaisha-kan-meneki) score includes 4 items such as i) hypothalamic–pituitary– adrenal (HPA) axis-related findngs (fukujin; i.e., dysfunction of HPA axis), ii) glycometabolismrelated findings (totaisha; i.e., glucose intolerance and dyslipidemia), iii) hepatic related findings (kan; e.g., chronic fatigue, lassitude), iv) immune system-related findings (meneki; i.e., immune deficiency) . In addition, a total score of the KSAS refers to the total score of 1) and 2) above. In the present study, we focused on the total score, the Mental Index (Seishin-hencho) score, and the Physical Index (Fukujin-totaisha-kanmeneki) score of the KSAS for the analysis. All subjects were administered the Toho Medical Index (TMI)  at the entry of the study as screening. Then, we conducted the Beck’s Depression Inventory (BDI-II) , the State- Trait Anxiety Inventory (STAI) , the General Health Questionnaire 28-item (GHQ28) , and the KSAS  on all the subjects before and after PN acupuncture intervention. Participants were randomized equally into the active or sham acupuncture stimulation groups in a placebo-controlled design. All participants received PN acupuncture intervention for three days continuously. We applied disposable press needle (PN)-type acupuncture (Pyonex®, SEIRIN Co., Ltd.), in accordance with the Japanese Industrial Standard (JIS). Active PN has a 0.6mm length and 0.2mm diameter needle while sham PN does not have any needle . Target acupoints were determined according to the Kiiko Style regimen based on the Nagano acupuncture method for head blood stagnation (“Tobu-Oketsu” in Japanese) [29,30]. PN acupuncture was applied in eight locations, specifically PC4 and LI10 in both arms, and SP6 and SP9 in both legs symmetrically . We performed three-way repeated measures analysis of variance (ANOVA), with time as a within-subject factor and intervention (active vs. sham) and group (healthy subjects vs. patients with depression) as between-subject factors. Spearman’s correlation analyses were conducted for cross-sectional data between each index of the KSAS and each outcome of the psychological tests at baseline as well as for longitudinal data of them before and after the PN acupuncture intervention. Here, we performed the correlation analysis for all subjects by mixing the two groups of healthy subjects and depressed patients; because we assumed that, it would be a continuous condition as a spectrum from healthy to depression in terms of the imbalance of autonomic nervous system and/or endocrine system. In addition, we also conducted the crosssectional correlation analyses between total score of the KSAS and other psychometrics outcome at baseline for each group (i.e., depressed patients and healthy subjects) to explore more specific relationship in the group. A significance level of alpha was 0.05 in the correlation analysis. Further, we calculated receiver operating characteristic (ROC) curves to see the sensitivity and specificity of the KSAS index compared to other psychological batteries, and created relative cumulative frequency distribution (RCD) curve to decide the cut-off point in a total score of the KSAS. The ANOVA showed significant main effects of group on the total score (F1, 38=9.893, P=0.003), the Mental Index score (F1, 38=11.769, P=0.002), and the Physical Index score (F1, 38=5.5325, P=0.024) of the KSAS. The descriptive data at baseline indicated that healthy subjects group showed an average score of 11.8 ± 10.2 in the total score, 3.6 ± 2.5 in the Mental Index score, and 8.3 ± 8.1 in the Physical Index score of the KSAS, whereas depressed patients group demonstrated an average score of 20.3 ± 11.4 in the total score, 8.7 ± 5.2 in the Mental Index score, and 11.6 ± 7.9 in the Physical Index score. Thus, patients with depression showed significantly higher values on the abovementioned scores in the KSAS compared to healthy subjects. At baseline, we observed significant positive correlations between the total score of the KSAS and the scores on autonomic symptoms of the TMI (ρ=0.582, P<0.001, N=42), psychiatric symptoms of the TMI (ρ=0.424, P=0.005, N=42), BDI-II (ρ=0.428, P=0.005, N=42), traitanxiety scale of the STAI (ρ=0.477, P=0.001, N=42) (Figure 1A). In addition, correlation analyses for depressed patient group indicated that total score of the KSAS significantly correlated with scores on autonomic symptoms of the TMI (ρ=0.402, p=0.028, N=30), the BDIII (ρ=0.471, p=0.009, N=30), and trait-anxiety scale of the STAI (ρ=0.392, p=0.032, N=30) (Figure 1B). However, there was no correlation between total score of the KSAS and score on psychiatric symptoms of the TMI (ρ=0.154, p=0.417, N=30). On the other hand, correlation analyses for healthy control group showed that total score of the KSAS significantly correlated with score on autonomic symptoms of the TMI (ρ=0.665, p=0.018, N=12) (Figure 1C). However, there were no correlations between total score of the KSAS and scores on the BDIII (ρ=-0.179, p=0.579, N=12), trait-anxiety scale of the STAI (ρ=-0.132, p=0.682, N=12), and psychiatric symptoms of the TMI (ρ=0.273, p=0.391, N=12). Figure 1a: Results of significant positive correlations at baseline for all subjects 1) between the total score of the KSAS and the score on autonomic symptoms of the TMI (ρ=0.582, P<0.001, N=42), 2) between the total score of the KSAS and the psychiatric symptoms of the TMI (ρ=0.424, P=0.005, N=42), 3) between the total score of the KSAS and score of the BDI-II (ρ=0.428, P=0.005, N=42), and 4) between the total score of the KSAS and the score on trait-anxiety scale of the STAI (ρ=0.477, P=0.001, N=42). Figure 1b: Results of significant positive correlations at baseline for depressed patients 1) between the total score of the KSAS and the score on autonomic symptoms of the TMI (ρ=0.402, p=0.028, N=30), 2) between the total score of the KSAS and score of the BDI-II (ρ=0.471, p=0.009, N=30), and 3) between the total score of the KSAS and the score on trait-anxiety scale of the STAI (ρ=0.392, p=0.032, N=30). Figure 1c: Results of significant positive correlations at baseline for healthy control subjects between the total score of the KSAS and the score on autonomic symptoms of the TMI (ρ=0.665, p=0.018, N=12). Further, there were significant positive correlations between the Mental Index score of the KSAS and the scores on autonomic symptoms of the TMI (ρ=0.555, P<0.001, N=42), the psychiatric symptoms of the TMI (ρ=0.480, P=0.001, N=42), BDI-II (ρ=0.501, P=0.001, N=42), state-anxiety scale of the STAI (ρ=0.405, P=0.008, N=42), trait-anxiety scale of the STAI (ρ=0.540, P<0.001, N=42), and total score on the GHQ28 (ρ=0.491, P=0.001, N=42) (Figure 2). Figure 2: Results of significant positive correlations at baseline for all subjects 1) between the Mental Index score of the KSAS and the score on autonomic symptoms of the TMI (ρ=0.555, P<0.001, N=42), 2) between the Mental Index score of the KSAS and the score on psychiatric symptoms of the TMI (ρ=0.480, P=0.001, N=42), 3) between the Mental Index score of the KSAS and the score of the BDI-II (ρ=0.501, P=0.001, N=42), 4) between the Mental Index score of the KSAS and the score on state-anxiety scale of the STAI (ρ=0.405, P=0.008, N=42), 5) between the Mental Index score of the KSAS and the score on trait-anxiety scale of the STAI (ρ=0.540, P<0.001, N=42), and 6) between the Mental Index score of the KSAS and the total score on the GHQ28 (ρ=0.491, P=0.001, N=42). The ROC curves created from the total score of the KSAS revealed a significant asymptotic P value (p=0.006; asymptotic 95% confidence interval: 0.608—0.945) and the area under curve (ACU) was 0.78 (Figure 3). Further, the RCD curve indicated the cut-off point of 13 in the total score of the KSAS (Figure 4). Based on this cut-off point, the sensitivity, specificity, and accuracy of the total score of the KSAS were 0.77, 0.75, and 0.76, respectively. Figure 3: Results of the ROC curves among the total score of the KSAS, BDI-II, GHQ28, autonomic symptoms score on the TMI, psychiatric symptoms score on the TMI, state-anxiety score on the STAI, and trait-anxiety score on the STAI. The ROC curves of the total score of the KSAS indicated a significant asymptotic P value (p=0.006). Figure 4: Results of the RCD curve of the total score of the KSAS. The RCD curve indicated the estimated cut-off point of 13 in the total score of the KSAS. The total score of the KSAS showed relatively good sensitivity (SN=0.77), specificity (SP=0.75), and accuracy (AC=0.76) on the basis of this cut-off point. It is important to note that there were no significant main effects of intervention at baseline in the total scores (F1, 38=2.557, P=0.118), the Mental Index score (F1, 38=0.167, P=0.685), and the Physical Index score (F1, 38=0.090, P=0.766). That is, we did not observe any significant differences on the scores of KSAS between active and sham PN acupuncture groups at baseline. The three-way ANOVA, with time as a withinsubject factor and intervention and group as between-subject factors, showed significant time-intervention interactions in the total score of KSAS (F1, 38=4.403, P=0.043) and the Physical Index score of KSAS (F1, 38=4.336, P=0.044). Indeed, active PN acupuncture group indicated -20.2 ± 19.2% (means ± S.E.) changes in their total score of KSAS while sham PN acupuncture group showed 8.3 ± 18.6% changes in the same index. Thus, active PN group showed a significant improvement in the total score of KSAS, compared to sham PN group. Figure 5 shows the changes between active and sham PN acupuncture groups on the total score of the KSAS. However, we did not observe significant timeintervention interactions in the Mental Index score (F1, 38=2.471, P=0.124) of the KSAS. 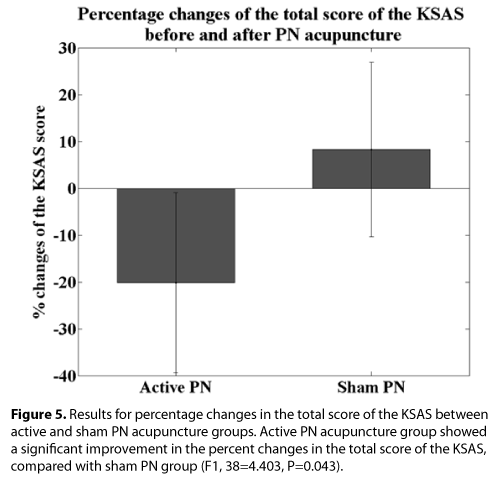 Figure 5: Results for percentage changes in the total score of the KSAS between active and sham PN acupuncture groups. Active PN acupuncture group showed a significant improvement in the percent changes in the total score of the KSAS, compared with sham PN group (F1, 38=4.403, P=0.043). Correlation analysis in active PN intervention group demonstrated the following results. First, in the analysis for all subjects, there was a significant correlation between the absolute changes of the total score of the KSAS and the score of the BDI-II (ρ=0.499, P=0.021, N=21), while there was a trend level correlation between the absolute changes of total score of the KSAS and score on state-anxiety scale of the STAI (ρ=0.426, P=0.054, N=21) following active PN acupuncture (Figure 6). Second, when we focused on only depressed patients in this correlation analysis, we still observed a significant correlation between the absolute changes of the total score of the KSAS and the score of the BDI-II (ρ=0.556, P=0.031, N=15) (Figure 6). However, we did not observe a significant correlation between the absolute changes of the total score of the KSAS and the score of the GHQ28 as well as between the absolute changes of the total score of the KSAS and the score on trait-anxiety scale of the STAI. Figure 6: Results of a longitudinal correlation analysis with active PN intervention between the total score of the KSAS and score of the BDI-II. There was a significant correlation between the absolute changes of the total score of the KSAS and the BDI-II (ρ=0.499, P=0.021, N=21) in all subjects’ analysis. Further, there was a significant correlation between the absolute changes of total score of the KSAS and score on state-anxiety scale of the STAI (ρ=0.556, P=0.031, N=15). The present study demonstrated several important findings as follow. In a crosssectional comparison between healthy subjects and depressed patients groups at baseline, we observed significant differences in their total score, the Mental Index score, and the Physical Index score of the KSAS. Thus, these results indicate that the KSAS measures may capture the symptoms of somatization of depression in the context of acupuncture medicine as a useful cross-sectional rating scale between healthy subjects and depressed patients . Further, in a longitudinal analysis, we observed significant correlations between changes of the total score of the KSAS and BDI-II as well as state-anxiety scale of the STAI, which means the KSAS measure may be a useful acupuncture-based psychometry to evaluate the clinical effect of acupuncture. In the cross-sectional correlation analysis at baseline, there were significant correlations between the total score of the KSAS and the score on autonomic symptoms measured by the TMI, between the total score of the KSAS and the score of the depressive symptoms measured by the BDI-II, and between the total score of KSAS and the score on trait-anxiety symptoms measured by the STAI. It means that the total score of the KSAS could be a useful rating scale for depression, especially for masked type depression, in the context of acupuncture medicine. In addition, regarding the Mental Index score of the KSAS, we also observed significant positive correlations with the score of the BDI-II, the score on state- and trait-anxiety scales of the STAI, and the total score of the GHQ28. These findings suggest that the Mental Index (Seishin-henchou) score in the context of acupuncture medicine could capture depressive and anxiety symptoms as well as general health condition properly. Specifically, since major depressive disorder often manifests psychiatric anxiety symptoms [32,33], the Mental Index score of the KSAS would be a promising measure for most of depression. 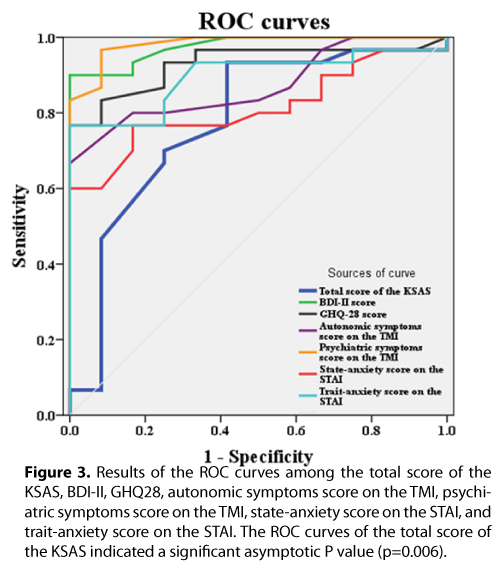 Further, the ROC curve of the total score of the KSAS demonstrated comparable sensitivity and specificity to other psychological tests to detect the patients with depression correctly (Figure 3). The sample size in the present study is small, however, this preliminary results warrant further study with larger samples. With respect to the longitudinal changes in the scores of the KSAS measure following PN acupuncture, active PN induced significant improvement of the total score as well as the Physical Index score of the KSAS, compared to sham PN. In addition, since there was a significant correlation between longitudinal changes of the total score of the KSAS and the score of the BDI-II, it is suggesting that the KSAS measure has good validity to assess depressed patients, specifically for evaluation of depressive and anxiety symptoms, in the context of acupuncture medicine. Indeed, in the previous study, as we have confirmed that active PN acupuncture induced a significant improvement on the score of the BDI-II , our prior finding also support the current result. Also, considering the clinical characteristics of the patients with depression who have participated in the present study; that is, the depressed patients who were suffering from medicationresistant depression or not responding well to other usual treatment for depression, the KSAS measure could be an unique measure in acupuncture medicine to assess physical symptoms of depressed patients, specifically for treatment-resistant depression as well as subtype of depression such as masked depression. There are some limitations in this study. First, since we assessed only subjective measures of psychological batteries, there may be some bias in reporting their symptoms, especially in patients group. Second, as the sample size was relatively small, further study in a larger sample is required to replicate and warrant our findings. In conclusions, the present study suggested that the KSAS measure has enough diagnostic validity to detect depression as well as reasonable utility to capture the curative effect of PN acupuncture in patients with depression. This study was performed by a research grant of the Pfizer Health Research Foundation. This research was supported by Kanagawa Psychiatric Center. YN and MN conceptualized and designed the study. HM, AI, YS, AS, YS, and GI performed PN acupuncture and assessed the KSAS. YN analyzed the data and drafted the manuscript. YN and MN revised the manuscript. KM and HI supervised this study. We would like to thank Ms. Misa Inoue and Ms. Chiaki Osawa for their support in this study. We greatly appreciate all subjects who participated in the study. Nahas R, Sheikh O (2011) Complementary and alternative medicine for the treatment of major depressive disorder. Can Fam Physician 57: 659-663. Sarris J (2011) Clinical depression: an evidence-based integrative complementary medicine treatment model. AlternTher Health Med 17: 26-37. Sarris J, Lake J, Hoenders R (2011) Bipolar disorder and complementary medicine: current evidence, safety issues, and clinical considerations. J Altern Complement Med 17: 881-890. Frass M, Strassl RP, Friehs H, Müllner M, Kundi M, et al. (2012) Use and acceptance of complementary and alternative medicine among the general population and medical personnel: a systematic review. Ochsner J 12: 45-56. Pilkington K (2010) Anxiety, depression and acupuncture: A review of the clinical research. AutonNeurosci 157: 91-95. Wu J, Yeung AS, Schnyer R, Wang Y, Mischoulon D (2012) Acupuncture for depression: a review of clinical applications. Can J Psychiatry 57: 397-405. Freeman MP, Fava M, Lake J, Trivedi MH, Wisner KL, et al. (2010) Complementary and alternative medicine in major depressive disorder: the American Psychiatric Association Task Force report. J Clin Psychiatry 71: 669-681. Takahashi T (2011) Mechanism of acupuncture on neuromodulation in the gut--a review. Neuromodulation 14: 8-12. Dirmaier J, Steinmann M, Krattenmacher T, Watzke B, Barghaan D, et al. (2012) Non-pharmacological treatment of depressive disorders: a review of evidence-based treatment options. Rev Recent Clin Trials 7: 141-149. Takeichi M, Sato T, Takefu M (2001) Studies on the psychosomatic functioning of ill-health according to Eastern and Western medicine 6. Psychosomatic characteristics of anxiety and depression. Am J Chin Med 29: 247–264. Shang C (2001) Emerging paradigms in mind-body medicine. J Altern Complement Med 7: 83-91. Purdy J (2013) Chronic physical illness: a psychophysiological approach for chronic physical illness. Yale J Biol Med 86: 15-28. Mei MF (2011) A systematic analysis of the theory and practice of syndrome differentiation. Chin J Integr Med 17: 803-810. Wang Q (2012) Individualized medicine, health medicine, and constitutional theory in Chinese medicine. Front Med 6: 1-7. Chan C, Ho PS, Chow E (2001) A body-mind-spirit model in health: an Eastern approach. Soc Work Health Care 34: 261-282. Romand D (2010) ["The mind-body problem". The relation of psychical to physical in 19th century German psychology]. Rev Synth 131: 35-51. Cheng AT (2001) Case definition and culture: Are people all the same? Br J Psychiatry 179: 1-3. Marsella AJ (1978) Thoughts on cross-cultural studies on the epidemiology of depression. Cult Med Psychiatry 2: 343-357. Stompe T, Ortwein-Swoboda G, Chaudhry HR, Friedmann A, Wenzel T, et al. (2001) Guilt and depression: a cross-cultural comparative study. Psychopathology 34: 289-298. Radford MH Nakane Y, Ohta Y, Mann L, Kalucy RS (1991) Decision making in clinically depressed patients. A transcultural social psychological study. J NervMent Dis 179: 711-719. Waza K, Graham AV, Zyzanski SJ, Inoue K (1999) Comparison of symptoms in Japanese and American depressed primary care patients. FamPract 16: 528-533. Parker G, Cheah YC, Roy K (2001) Do the Chinese somatize depression? A cross-cultural study. Soc Psychiatry PsychiatrEpidemiol 36: 287-293. UluÅŸahin A, BaÅŸoÄŸlu M, Paykel ES (1994) A cross-cultural comparative study of depressive symptoms in British and Turkish clinical samples. Soc Psychiatry PsychiatrEpidemiol 29: 31-39. Nakamura M, Murakami H, Ito A, Shinse Y, Suzuki A, et al. (2012) K-style Acupuncture Score (KSAS); its reliability and clinical correlation. Clinical Psychiatry 41: 323–332. Nakano K (1984) Check list and evaluation method of subjective symptom for identifying autonomic nerve complaints. Roppo-shuppan, Tokyo 358-359. Beck AT, Steer RA, Brown GK (1996) BDI-II. Beck Depression Inventory. (Second Edition), Psychological Corporation, San Antonio, TX. Spielberger CD, Gorsuch RL, Lushene R, Vagg PR, Jacobs GA (1983) Manual for the State-Trait Anxiety Inventory. Consulting Psychologists Press, Palo Alto, CA. Goldberg DP (1978) Manual of the General Health Questionnaire. NFER Publishing, Windsor, England. Noda Y, Izuno T, Tsuchiya Y, Hayasaka S, Matsumoto K, et al. (2015) Acupuncture-induced changes of vagal function in patients with depression: A preliminary sham-controlled study with press needles. Complementary Therapies in Clinical Practice 21: 193–200. Matsumoto K, Euler D (2005) Kiiko Matsumoto's Clinical Strategies. In the Spirit of Master Nagano. (vol.1) Naturmed, Munich, Germany. Kinoshita H (2010) Illustration of Acupuncture Point. Ido No Nippon Sha, Kanagawa, Japan. Gascón MR, Ribeiro CM, Bueno LM, Benute GR, Lucia MC, Rivitti EA, FestaNeto C (2012) Prevalence of depression and anxiety disorders in hospitalized patients at the dermatology clinical ward of a university hospital. An Bras Dermatol 87: 403–407. Goldberg D, Fawcett J (2012) The importance of anxiety in both major depression and bipolar disorder. Depress Anxiety 29: 471-478.